Creative competitions help you connect with your community. 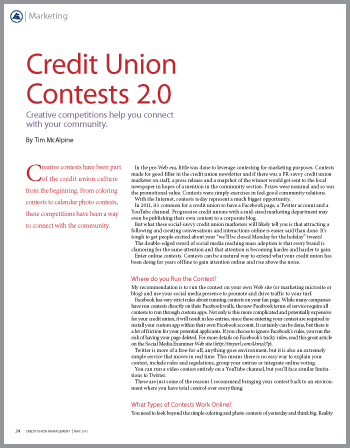 Creative contests have been part of the credit union culture from the beginning. From coloring contests to calendar photo contests, these competitions have been a way to connect with the community. In the pre-Web era, little was done to leverage contesting for marketing purposes. Contests made for good filler in the credit union newsletter and if there was a PR-savvy credit union marketer on staff, a press release and a snapshot of the winner would get sent to the local newspaper in hopes of a mention in the community section. Prizes were nominal and so was the promotional value. Contests were simply exercises in feel-good community relations. With the Internet, contests today represent a much bigger opportunity. In 2011, it’s common for a credit union to have a Facebook page, a Twitter account and a YouTube channel. Progressive credit unions with a mid-sized marketing department may even be publishing their own content to a corporate blog. But what these social-savvy credit union marketers will likely tell you is that attracting a following and creating conversations and interactions online is easier said than done. It’s tough to get people excited about your “we’ll be closed Monday for the holiday” tweets! The double-edged sword of social media reaching mass adoption is that every brand is clamoring for the same attention and that attention is becoming harder and harder to gain. Enter the possibilities of online contests. Contests can be a natural way to extend what your credit union has been doing for years offline to gain attention online and rise above the noise. Where do you run the contest? My recommendation is to run the contest on your own website (or marketing microsite or blog) and use your social media presence to promote and drive traffic to your turf. Facebook has very strict rules about running contests on your fan page. While many companies have run contests directly on their Facebook walls, the new Facebook terms of service require all contests to run through custom apps. Not only is this more complicated and potentially expensive for your credit union, it will result in less entries, since those entering your contest are required to install your custom app within their own Facebook account. It certainly can be done, but there is a lot of friction for your potential applicants. If you choose to ignore Facebook’s rules, you run the risk of having your page deleted. For more details on Facebook’s tricky rules, read this great article on the Social Media Examiner website. Twitter is more of a free-for-all, anything-goes environment, but it is also an extremely simple service that moves in real time. This means there is no easy way to explain your contest, include rules and regulations, group your entries or integrate online voting. You can run a video contest entirely on a YouTube channel, but you’ll face similar limitations to Twitter. These are just some of the reasons I recommend bringing your contest back to an environment where you have total control over everything. What types of contests work online? You need to look beyond the simple coloring and photo contests of yesterday and think big. Reality TV shows are a great place to draw inspiration. Just look at the popularity of “American Idol,” “Dancing with the Stars,” “The Apprentice,” “The Amazing Race” and “The Biggest Loser,” to name a few. People love to compete and, more importantly, people love to watch and support those who compete. It’s important when dreaming up your contest theme to really think about how you can drive membership and share-of-wallet growth in conjunction with your contest. All the attention in the world won’t translate into income if you are not also selling your products and services at the same time. There are so many possibilities for contest themes, but I would steer you toward contests that require entrants to get creative. By requiring your entrants to spend time thinking and creating, they will be more inclined to seriously promote their entry and spread the word through their own online social circles. Throughout the past four years of running our Young & Free young adult marketing programs, we’ve experimented with all types of online contest. Here’s a few to consider. Young & Free is best known for its Young & Free Spokester job contest. Young people in each region enter to fill this full-time blogger position by creating a 60-second YouTube application video and a 500-word blog post. The credit union shortlists all entries to a top three and then the public votes for the winner. To promote this ultimate job competition, we’ve used a mix of traditional, guerilla and online marketing activities to spread the word. We have held more than a dozen of these searches and they are extremely popular, drawing significant attention and traffic. The Young & Free Spokester job contest works because the prize is significant and attractive. A $30,000 salary, all the tech gear the winner needs to blog and make videos for a year, plus the use of a car makes for a very sweet gig that has attracted hundreds of applicants. We have run T-shirt design contests with Young & Free Alabama powered by $420 million/56,000-member Listerhill Credit Union, Sheffield, Ala., and Young & Free Alberta powered by $10 billion/400,000-member Servus Credit Union, Edmonton, Alberta. In addition to promoting the contest with online advertising and through the social Web, we also made sure to reach out to area high school and post secondary design programs to get on the radar of potential entrants. The prizes in these two contests were vastly different. In Alabama, the selected T-shirt was printed and the winner received a year’s worth of movie passes. In Alberta, the grand prize was an all-expense-paid trip to New York City. In Alabama, the public voted for their favorite T-shirt design and in Alberta, a group of credit union employees and representatives from the local design industry judged the entries. Both of these contests were quite popular and drew a decent number of entries and traffic. The latter drew considerably more entries due to the prize and also the credit union’s size. In 2009, we ran a very successful battle of the bands promotion with Young & Free South Carolina powered by $1.3 billion/130,000-member South Carolina Federal Credit Union, North Charleston, S.C. Entitled Last Band Standing, this challenge encouraged local bands to submit their original music and rock videos. All bands were put to a public vote to narrow down to the top five. These five bands performed at a sold-out show, with proceeds going to a local charity and were scored by a celebrity judging panel. The winner received $1,000 and a spot on stage at Shine Fest ’09, a major outdoor festival concert. Organizing a contest of this scale is not for the faint of heart. Finding a venue, getting the word out, recruiting local celebrity musicians as judges and managing the technical aspects of the show made Last Band Standing a major undertaking. The key for South Carolina FCU was partnering with a local arts newspaper with a plugged-in music critic. The CU’s ongoing partnership with a popular local radio station also helped tremendously. The payoff was worth the effort. As we suspected, independent bands really know how to promote themselves! Imagine 25 bands reaching out to their networks and driving enormous traffic and attention to the CU within the prime Gen Y target. At the concert, South Carolina FCU made sure to have a laptop to sign up new members on the spot. Running an online scholarship contest is a great way to build upon something you are likely already doing. We have run two scholarship contests with partner credit unions and are planning quite a few more based on the great success we’ve seen. In Alberta, Servus CU gave away 30, $1,000 scholarships and in South Carolina, South Carolina FCU gave away three scholarships totaling $7,500 with the top prize being $5,000. Alberta drew more than 240 applicants and South Carolina drew more than 100 applicants. Clearly this type of contest resonates with young people. In both Alberta and South Carolina, applicants could choose to write a 500-word essay or create a 60-second YouTube video based on a prescribed theme. Applicants could upload all their required school documents within the secure application form. With so many required elements (photo, transcripts, proof of enrollment and resume), it is critical to figure out your systems and who is taking care of what aspects of the approval and posting process. Judging was left to a panel of credit union employees and the winners were revealed on line. In Alberta, to add a crowd-participation and word-of-mouth element, we held a people’s choice public vote for three iPad prizes. Based on the popularity of reality shows Dancing with the Stars and So You Think You Can Dance, we helped Servus CU hold the 2011 Young & Free Dance Challenge. 41 fantastic individuals and groups participated. The contest drew incredible traffic, interest and participation. The public voted for the winner who received a $4,000 grand prize. During the voting phase, we managed to grow our opt-in e-mail database by more than 5,000 subscribers! Credit unions are known for supporting local charities and are inundated with requests for donations all year long. Why not build a contest around charitable giving? That’s exactly what we did for Seattle’s $380 million/25,000-member Verity Credit Union. In January 2011, Verity conducted the Cartwheel for a Cause Video Contest in conjunction with its Verity Mom social media program. Submission videos were required with a description of the cause that the entrant thought deserved a $5,000 donation and a cartwheel. All 37 entries were put to a public vote and more than 13,000 individuals came to the site and voted! It was a great way to give back to the community and also draw attention to Verity’s Cartwheel Checking product. We have found online contests need to have big prizes to gain attention and attract entries. For creative contests that culminate in the award of a prize, the top prize should be at least $1,000. Also consider awarding more than just a top prize. According to Forrester Research, online contests that offer prizes to second and third place finishers draw almost twice as many entries. Everyone likes cash, but consider other creative prizes as well. Tech toys make great runner-up prizes and can feel more valuable than their cash equivalent. Consider iPads, xBoxes and Amazon Kindles to pique possible entrants’ interest. and promote your contest on your Facebook page. As long as the actual voting takes place on your own Web site, you are within Facebook’s promotional rules. We typically keep our application phase open for four to six weeks. During this time you’ll want to continue to build excitement and interest, so I highly recommend posting applicants as they come in. If you are running a video contest, use YouTube vs. trying to have applicants submit raw video files to you. Not only will this be easier to handle, YouTube videos are easily embeddable and shareable. Include Facebook “Like” and Twitter “Tweet” buttons to allow friends, family and fans to push the entries to their social circles. It is also very important to encourage your applicants to promote their entries. Give them promotional ideas and graphics to include on their own blogs and social profiles. I am a big proponent of allowing the public to select the winner of online contests. Not only does this promote openness and transparency, it also drives a ton of traffic and interest well beyond just the applicants. Our electronic ballot is typically programmed to accept one vote per legitimate e-mail address. We have experimented with unlimited voting like American Idol but I feel that for a local contest, unlimited voting does not necessarily pick the best, the most deserving winner! If you choose to have your winner selected by a judging panel, make sure to pick a mix of credit union employees and subject matter experts from within your community to sit on the panel. A combination of a judging panel to narrow the field and a public vote to pick the winner or vice versa is also a smart way to add variety and interest. And last but certainly not least, I recommend that all contest rules be reviewed by your legal counsel. You don’t want all your time, effort and promotion to turn sour if your contest rules are not properly vetted. If you want to take your social media activity to the next level, you should definitely try an online contest. Put together a creative challenge with a significant prize and rise above the cutter! Really, you are only limited by your imagination and what people can do online!